Pesticides are used to kill insects that destroy crops or damage buildings. They may be used in agricultural and gardening settings, as well as in offices and homes. However, if they are not handled appropriately, they may cause significant harm to human beings, and victims may need to consult a pesticide exposure attorney to evaluate whether they should take legal action. Sometimes the harm is immediately apparent, while in other cases, years pass before the harm is clear. 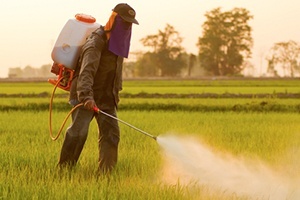 Pesticides may harm the nervous system, organs, and skin. They may also cause cancer and other illnesses. If you suffer injuries as a result of pesticide exposure, the experienced toxic tort attorneys at Moll Law Group can file a lawsuit seeking compensation on your behalf. In most cases, lawsuits seeking compensation for pesticide exposure are brought on the basis of a defendant's negligence. As a victim of pesticide exposure, you will need to show that the defendant owed you a duty of reasonable care and that its breach of that duty caused your injuries. For example, if a nearby farm sprayed pesticide without considering its impact on groundwater or air and how it would affect the neighbors, it may have breached its duty to use reasonable care. If there are federal, state, or local regulations that govern how pesticides are used and which safety measures must be employed, it may be possible to use the regulations to establish the standard of care. Sometimes proving that pesticide exposure caused a particular illness or injury may be challenging. Defendants may argue that your exposure to some other chemical was the true cause of the injury. Often, it is necessary to retain experts to provide opinions about the causal connection between pesticide exposure and the particular illness at hand. It is important to retain a pesticide exposure lawyer who works with persuasive and knowledgeable experts. In some cases, pesticide exposure lawsuits are brought on the basis of product liability theories. Generally, pesticide manufacturers are expected to take precautions to prevent users from being harmed by the normal use of pesticide. If the manufacturer formulates the pesticide in an unreasonably dangerous way or fails to provide adequate warnings, consumers as well as bystanders may be adversely affected. A pesticide manufacturer may be held accountable if its instructions or its warnings are inadequate to warn people who could foreseeably be exposed to the pesticide. Theories that may be appropriate in a failure to warn case include strict liability or negligence. If you are able to establish a toxic tort or product liability case, you may be able to recover economic and noneconomic forms of compensation. These typically include lost wages, lost earning capacity, medical expenses, household services, pain and suffering, mental anguish, and loss of consortium. If you believe that you were harmed by pesticide exposure, you should consult the pesticide exposure lawyers at Moll Law Group. Our firm represents people throughout the nation, including in states such as Illinois, Ohio, New York, Pennsylvania, California, Texas, and Florida. Billions of dollars have been recovered in cases in which our personal injury attorneys have been involved. Contact us online or call us at 312-462-1700 to set up a free consultation.